The Union of European Football Associations is the administrative body for association football, futsal and beach soccer in Europe, although several member states are primarily or entirely located in Asia. It is one of six continental confederations of world football's governing body FIFA. UEFA consists of 55 national association members. The FIFA Confederations Cup was an international association football tournament for men's national teams, held every four years by FIFA. It was contested by the holders of each of the six continental championships, along with the current FIFA World Cup holder and the host nation, to bring the number of teams up to eight. The Spain national football team represents Spain in international men's association football since 1920, and is controlled by the Royal Spanish Football Federation, the governing body for football in Spain. 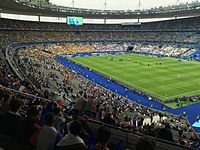 Stade de France is the national stadium of France, located just north of Paris in the commune of Saint-Denis. Its seating capacity of 80,698 makes it the eighth-largest stadium in Europe. The stadium is used by the France national football team and French rugby union team for international competition. The Stadium is the largest in Europe for track and field events, seating 78,338 in that configuration. Despite that, the stadium's running track is mostly hidden under the football pitch. Originally built for the 1998 FIFA World Cup, the stadium's name was recommended by Michel Platini, head of the organising committee. On 12 July 1998, France defeated Brazil 3–0 in the 1998 FIFA World Cup Final contested at the stadium. It will host the opening and closing ceremonies and the athletics events at the 2024 Summer Olympics. It will also host matches for the 2023 Rugby World Cup. Saint-Denis is a commune in the northern suburbs of Paris, France. It is located 9.4 km (5.8 mi) from the centre of Paris. Saint-Denis is a subprefecture of the department of Seine-Saint-Denis, being the seat of the arrondissement of Saint-Denis. The French Football Federation (FFF) is the governing body of football in France. It also includes the overseas departments and the overseas collectivities and also in Monaco. It was formed in 1919 and is based in the capital, Paris. The FFF was a founding member of FIFA and is responsible for overseeing all aspects of the game of football in France, both professional and amateur. The French Football Force is a founding member of UEFA and joined FIFA in 1907 after replacing the USFSA, who were founding members. Henri Delaunay was a French football administrator. The Soviet Union national football team was the national football team of the Soviet Union. The 1964 UEFA European Nations' Cup was the second European Championship. The final tournament was held in Spain. It was won by the hosts 2–1 over defending champions Soviet Union. The Greece national football team represents Greece in association football and is controlled by the Hellenic Football Federation, the governing body for football in Greece. Greece's main home grounds are located in the capital-city Athens at the Olympic Stadium in Maroussi and also in the port of Piraeus at the Karaiskakis Stadium. Greece is one of only ten national teams to have been crowned UEFA European Champions. The Albania national football team is the men's football team that has represented Albania in international competition since 1946 and is controlled by the Albanian Football Association which is headquartered in the city of Tirana. The team is affiliated with UEFA and competes in the three major professional tournaments, the FIFA World Cup, UEFA European Championship and the UEFA Nations League. Albania was the winner of the 1946 Balkan Cup and the 2000 Malta Rothmans International Tournament. At Euro 2016, Albania made its debut at a major men's football tournament. Albania scored their first ever goal in a major tournament and secured their first ever win in a European Championship, when they beat Romania on 19 June 2016. UEFA Euro 1992 was held in Sweden, and was won by Denmark, who were only in the finals because UEFA did not allow Yugoslavia to participate as some of the states constituting the Socialist Federal Republic of Yugoslavia were at war with each other. The Danes beat holders the Netherlands on penalties in the semi-finals,  then defeated world champion Germany 2–0. This was the first tournament in which a unified Germany took part and also the first major tournament to have the players' names printed on their backs. 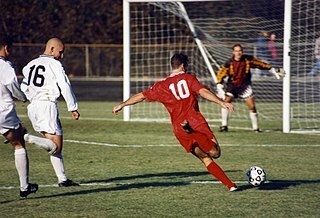 England hosted UEFA Euro 1996, the first tournament to use the nomenclature "Euro [year]" and would see the number of teams taking part double to 16. The hosts, in a replay of the 1990 FIFA World Cup semi-final, were knocked out on penalties by Germany,  who would go on to win in the Final 2–1 against the newly formed Czech Republic thanks to the first golden goal ever in a major tournament, scored by Oliver Bierhoff. This was Germany's first title as a unified nation. The 2008 tournament, hosted by Austria and Switzerland, marked the second time that two nations co-hosted and the first edition where the new trophy was awarded. It commenced on 7 June and finished on 29 June. The Final between Germany and Spain was held at the Ernst Happel Stadion in Vienna. Spain defeated Germany 1–0, with a goal scored by Fernando Torres in the 33rd minute, sparking much celebration across the country. This was their first title since the 1964 tournament. Spain were the highest scoring team with 12 goals scored and David Villa finished as the top scorer with four goals. Xavi was awarded the player of the tournament, and nine Spanish players were picked for the team of the tournament. The UEFA Euro 2012 tournament was co-hosted by Poland and Ukraine. Spain defeated Italy 4–0 in the final, thus becoming the first nation to defend a European Championship title and the first nation to win three major international tournaments in succession (Euro 2008, 2010 World Cup, Euro 2012). In scoring the third goal of the Final, Fernando Torres became the first player to score in two European Championship finals. He was equal top scorer for the tournament with three goals in total, along with Mario Balotelli, Alan Dzagoev, Mario Gómez, Mario Mandžukić, and Cristiano Ronaldo, despite only being used as a substitute player. The tournament was otherwise notable for having the most headed goals in a Euro tournament (26 out of 76 goals in total); a disallowed goal in the England versus Ukraine group game which replays showed had crossed the goal line, and which prompted President of FIFA Sepp Blatter to tweet, "GLT (Goal-line technology) is no longer an alternative but a necessity",  thus reversing his long-held reluctance to embrace such technology; and some crowd violence in group games. In 2007, the Football Association of Ireland and Scottish Football Association proposed the expansion of the tournament, which was later confirmed by the UEFA Executive Committee in September 2008. Out of the 54 member associations of UEFA, only three including England and Germany opposed the expansion. On 28 May 2010, UEFA announced that Euro 2016 would be hosted by France. France beat bids of Turkey (7–6 in voting in second voting round) and Italy, which had the fewest votes in the first voting round. UEFA Euro 2016 was the first to have 24 teams in the finals. This was the third time France have hosted the competition. Portugal, which qualified for the knock-out phase despite finishing third in its group, went on to win the championship by defeating heavily favoured host team France 1–0 in the final, thanks to a goal from Eder in the 109th minute. Cristiano Ronaldo, Portugal's world renowned striker, came out of the game due to injury in the 25th minute. This was the first time Portugal won a major tournament. The Henri Delaunay Trophy, which is awarded to the winner of the European Championship, is named in honour of Henri Delaunay, the first General Secretary of UEFA, who came up with the idea of a European championship but died five years prior to the first tournament in 1960. His son, Pierre, was in charge of creating the trophy. Since the first tournament it has been awarded to the winning team for them to keep for four years, until the next tournament. The players and coaches of the winning team and the runner-up team are awarded gold and silver medals, respectively. Each association that competes in the final tournament receives a commemorative plaque. Each losing semi-finalist as well as each finalist receive a dedicated plaque. Though there is no longer a third place play-off, UEFA decided in the 2008 edition to award the semi-final losers (Turkey and Russia) bronze medals for the first time,  and did the same in the 2012 edition when Germany and Portugal received bronze medals. However, UEFA decided that losing semi-finalists would no longer receive medals from the 2016 edition onwards. Bronze medals were previously awarded for winners of the third place play-off, the last of which was held in 1980. ↑ No extra time was played. ↑ No third place play-off has been played since 1980; losing semi-finalists are listed in alphabetical order. The 1980 UEFA European Football Championship final tournament was held in Italy. This was the sixth European Football Championship, which is held every four years and endorsed by UEFA. It was the first edition to feature eight teams, taking place between 11 and 22 June 1980. West Germany won the final 2–1 for their second title. This was the last European Championship with a third place play-off. The Wales national football team represents Wales in international football. It is controlled by the Football Association of Wales (FAW), the governing body for football in Wales and the third-oldest national football association in the world. The 1972 UEFA European Football Championship final tournament was held in Belgium. This was the fourth European Football Championship, held every four years and endorsed by UEFA. The final tournament took place between 14 and 18 June 1972. The 1968 UEFA European Football Championship final tournament was held in Italy. This was the third European Football Championship, an event held every four years and organised by UEFA. The final tournament took place between 5 and 10 June 1968. The 2013 UEFA Women's Championship, commonly referred to as Women's Euro 2013, was the 11th European Championship for women's national football teams organised by UEFA. The final tournament, held in Sweden from 10 to 28 July 2013, became the most-watched in the history of the Women's Euros. It concluded with Germany, the defending champions, winning their sixth consecutive and eighth overall Women's Euro title after defeating Norway in the final. The knockout phase of UEFA Euro 2012 began with the quarter-finals on 21 June 2012, and was completed on 1 July 2012 with the final at the Olympic Stadium in Kiev, won by Spain 4–0 against Italy. After the completion of the group stage on 19 June 2012, eight teams qualified for the quarter-finals, which are to be played from 21 to 24 June 2012. Host nations Poland and Ukraine failed to qualify for the quarter-finals, making it only the third time in European Championship history that the host nation(s) failed to make it out of the group stage; at Euro 2000, co-host Belgium were eliminated at the group stage, and at Euro 2008, co-hosts Austria and Switzerland also failed to qualify for the quarter-finals. The 2020 UEFA European Football Championship, commonly referred to as UEFA Euro 2020 or simply Euro 2020, is scheduled to be the 16th UEFA European Championship, the quadrennial international men's football championship of Europe organised by UEFA. The 2017 UEFA European Under-21 Championship was the 21st edition of the UEFA European Under-21 Championship, a biennial international youth football championship organised by UEFA for the men's under-21 national teams of Europe. The final tournament was hosted in Poland for the first time, after their bid was selected by the UEFA Executive Committee on 26 January 2015 in Nyon, Switzerland. The tournament took place from 16–30 June 2017. Players born on or after 1 January 1994 were eligible for the tournament. ↑ "2005/2006 season: final worldwide matchday to be 14 May 2006". FIFA.com. Fédération Internationale de Football Association. 19 December 2004. Retrieved 13 January 2012. ↑ Roxborough, Scott (24 June 2015). "Amid FIFA Scandal, EBU Buys Euro 2016 Rights". The Hollywood Report. Retrieved 13 June 2016. ↑ "Euro 2016 seen by 2 billion on TV; 600M tune in for final". ↑ "UEFA European Football Championship origins". UEFA.com. Union of European Football Associations. 21 December 2011. Retrieved 24 February 2012. ↑ "Delaunay's dream realised in France". UEFA.com. Union of European Football Associations. 30 January 2012. Retrieved 24 February 2012. ↑ "The Henri Delaunay Cup". UEFA.com. Union of European Football Associations. 28 January 2012. Retrieved 24 February 2012. 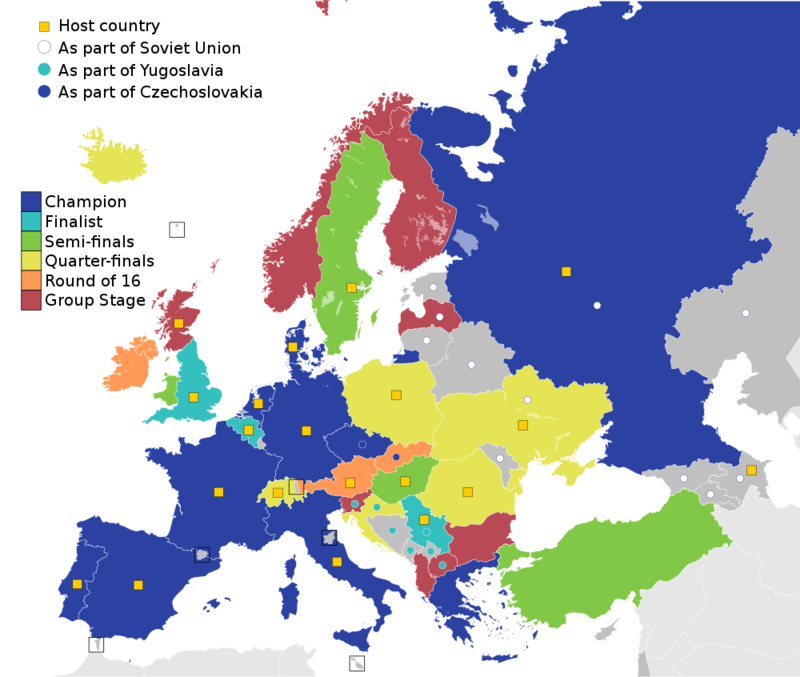 ↑ "1960 UEFA European Championship – Teams". UEFA.com. Union of European Football Associations. Retrieved 24 February 2012. ↑ "Ponedelnik heads Soviet Union to glory". UEFA.com. Union of European Football Associations. 1 October 2003. Retrieved 26 February 2012. ↑ Rostance, Tom (21 May 2012). "Euro 1960: Lev Yashin leads Soviets to glory in France". BBC Sport. British Broadcasting Corporation. Retrieved 11 June 2012. ↑ "France 1960". BBC Sport. British Broadcasting Corporation. 17 May 2004. Retrieved 24 February 2012. ↑ "Spain savour home comforts". UEFA.com. Union of European Football Associations. 21 December 2011. Retrieved 24 February 2012. ↑ "Spain 1964". BBC Sport. British Broadcasting Corporation. 17 May 2004. Retrieved 24 February 2012. ↑ "Spain's Marcelino stoops to conquer Europe". UEFA.com. Union of European Football Associations. 2 October 2003. Retrieved 26 February 2012. ↑ "Italy make most of good fortune". UEFA.com. Union of European Football Associations. 20 December 2011. Retrieved 24 February 2012. ↑ "Italy 1968". BBC Sport. British Broadcasting Corporation. 17 May 2004. Retrieved 24 February 2012. ↑ "Italy through to final after coin toss". UEFA.com. Union of European Football Associations. 2 October 2003. Retrieved 26 February 2012. ↑ "Italy earn final replay against Yugoslavia". UEFA.com. Union of European Football Associations. 2 October 2003. Retrieved 26 February 2012. ↑ "Riva return sparks Italy triumph". UEFA.com. Union of European Football Associations. 2 October 2003. Retrieved 26 February 2012. ↑ "1968 UEFA European Championship – Teams". UEFA.com. Union of European Football Associations. Retrieved 24 February 2012. ↑ "Müller the menace in German masterclass". UEFA.com. Union of European Football Associations. 3 October 2003. Retrieved 26 February 2012. ↑ "West Germany make their mark". UEFA.com. Union of European Football Associations. 20 December 2011. Retrieved 24 February 2012. ↑ "Belgium 1972". BBC Sport. British Broadcasting Corporation. 17 May 2004. Retrieved 24 February 2012. ↑ Dunbar, Graham (2 July 2010). "Abreu's 'Panenka' penalty revives 1976 classic". USA Today . Associated Press . Retrieved 9 June 2012. ↑ "Panenka the hero for Czechoslovakia". UEFA.com. Union of European Football Associations. 27 February 2008. Retrieved 9 June 2012. ↑ "Italy 1980". BBC Sport. British Broadcasting Corporation. 17 May 2004. Retrieved 24 February 2012. ↑ "Hrubesch turns West Germany's unlikely hero". UEFA.com. Union of European Football Associations. 4 October 2003. Retrieved 26 February 2012. ↑ "Hrubesch crowns West German win". UEFA.com. Union of European Football Associations. 21 June 2008. Retrieved 9 June 2012. ↑ "Platini shines for flamboyant France". UEFA.com. Union of European Football Associations. 20 December 2011. Retrieved 24 February 2012. ↑ "Platini reflects on France's first success in 1984". UEFA.com. Union of European Football Associations. 20 December 2011. Retrieved 24 February 2012. ↑ "France 1984". BBC Sport. British Broadcasting Corporation. 17 May 2004. Retrieved 11 June 2012. ↑ "Van Basten sparks Netherlands joy". UEFA.com. Union of European Football Associations. 20 December 2011. Retrieved 24 February 2012. ↑ "West Germany 1988". BBC Sport. British Broadcasting Corporation. 17 May 2004. Retrieved 24 February 2012. ↑ "Van Basten ends Dutch wait". UEFA.com. Union of European Football Associations. 5 October 2003. Retrieved 26 February 2012. ↑ "Van Basten remembers 'fantastic' EURO '88". UEFA.com. Union of European Football Associations. 20 December 2011. Retrieved 24 February 2012. ↑ "Denmark late show steals spotlight". UEFA.com. Union of European Football Associations. 30 January 2012. Retrieved 25 February 2012. ↑ "Sweden 1992". BBC Sport. British Broadcasting Corporation. 27 May 2004. Retrieved 25 February 2012. ↑ "Schmeichel helps Denmark down Netherlands". UEFA.com. Union of European Football Associations. 5 October 2003. Retrieved 26 February 2012. ↑ "Gatecrashing Denmark down Germany". UEFA.com. Union of European Football Associations. 5 October 2003. Retrieved 26 February 2012. ↑ "Football comes home for Germany". UEFA.com. Union of European Football Associations. 1 February 2012. Retrieved 25 February 2012. ↑ "Hosts denied by Germany in epic semi-final". UEFA.com. Union of European Football Associations. 6 October 2003. Retrieved 26 February 2012. ↑ "Bierhoff hero of Germany's EURO '96 win". UEFA.com. Union of European Football Associations. 6 October 2003. Retrieved 26 February 2012. ↑ "England 1996". BBC Sport. British Broadcasting Corporation. 17 May 2004. Retrieved 25 February 2012. ↑ Lister, Graham (1 December 2011). "Euro 2012 History: The 2000 finals". Goal.com. Retrieved 11 June 2012. ↑ "Golden boy Trezeguet relives France's 2000 glory". UEFA.com. Union of European Football Associations. 20 December 2011. Retrieved 25 February 2012. ↑ McNulty, Phil (20 December 2004). "Greece defy the odds at Euro 2004". BBC Sport. British Broadcasting Corporation. Retrieved 25 February 2012. ↑ "France 0–1 Greece". BBC Sport. British Broadcasting Corporation. 25 June 2004. Retrieved 25 February 2012. ↑ "Greece 1–0 Czech Rep". BBC Sport. British Broadcasting Corporation. 1 July 2004. Retrieved 25 February 2012. ↑ "Dellas delight stuns Czech Republic". UEFA.com. Union of European Football Associations. 2 July 2004. Retrieved 25 February 2012. ↑ "Limit on international substitutions". UEFA.com. Union of European Football Associations. 28 February 2004. Retrieved 25 February 2012. ↑ "All New Supersized Trophy for Euro 2008". worldcupblog.org. 2 May 2008. Retrieved 25 February 2012. ↑ "UEFA EURO 2008 – Match Schedule" (PDF). UEFA.com. Union of European Football Associations. Retrieved 25 February 2012. ↑ "Euro 2008 venues". BBC Sport. British Broadcasting Corporation. 27 May 2008. Retrieved 25 February 2012. ↑ McNulty, Phil (29 June 2008). "Germany 0–1 Spain". BBC Sport. British Broadcasting Corporation. Retrieved 25 February 2012. ↑ "EURO joy for Poland and Ukraine". UEFA.com. Union of European Football Associations. 19 April 2007. Retrieved 10 January 2012. ↑ 4 – 0 FT. "Spain v Italy live football scores | Soccer scores and live video". ESPNFC.com. Archived from the original on 15 January 2013. Retrieved 2 July 2012. ↑ "Sepp Blatter confident of positive goal-line technology vote". BBC Sport. British Broadcasting Corporation. 21 June 2012. Retrieved 2 July 2012. ↑ "Uefa to expand Euro Championship". BBC Sport . British Broadcasting Corporation. 26 September 2008. Retrieved 6 December 2017. ↑ "EURO expands to 24". UEFA.com. Union of European Football Associations. 26 September 2008. Retrieved 23 February 2014. ↑ "Michel Platini annoyed at England after they opposed expansion of Euro 2016". The Guardian. 22 February 2014. Retrieved 23 February 2014. ↑ "France beat Turkey and Italy to stage Euro 2016". BBC Sport. British Broadcasting Corporation. 28 May 2010. Retrieved 11 January 2012. ↑ "UEFA approves 24-team Euro from 2016". UEFA.com. Union of European Football Associations. 27 September 2008. Retrieved 22 June 2012. ↑ "TFF Başkanı'ndan Açıklama" [TFF President Announcement] (in Turkish). Turkish Football Federation. 17 April 2012. Retrieved 11 June 2012. ↑ "Scotland and Wales consider late joint bid to stage Euro 2020". The Guardian . Guardian Media Group. 14 May 2012. Retrieved 11 June 2012. ↑ "Georgia makes solo bid for Euro 2020". AFP. 15 May 2012. Retrieved 11 June 2012. ↑ "UEFA EURO 2020 to be held across continent". UEFA.com. Union of European Football Associations. 6 December 2012. Retrieved 24 January 2013. ↑ "Wembley to stage UEFA EURO 2020 final". UEFA.com. 19 September 2014. ↑ "EURO 2020 to open in Rome, more London games, venues paired". UEFA.com. Union of European Football Associations. 7 December 2017. Retrieved 7 December 2017. ↑ Harrold, Michael (27 January 2006). "You won't find a superior trophy". UEFA.com. London: Union of European Football Associations. Retrieved 13 January 2012. ↑ "New trophy for UEFA EURO 2008". UEFA.com. Union of European Football Associations. 24 January 2006. Retrieved 13 January 2012. ↑ "Regulations of the UEFA European Football Championship 2006/08" (PDF). 2.08: UEFA. p. 3. Retrieved 11 July 2016. ↑ "Regulations of the UEFA European Football Championship 2010–12" (PDF). 3.08: UEFA. p. 4. Retrieved 4 July 2012. 1 2 "Regulations of the UEFA European Football Championship 2014–16" (PDF). 4.08: UEFA. p. 11. Retrieved 2 September 2016. ↑ "Uefa sets deadline over Euro 2012". BBC Sport. British Broadcasting Corporation. 28 June 2008. Retrieved 13 May 2011. ↑ "Uefa to expand Euro Championship". BBC Sport. British Broadcasting Corporation. 26 September 2008. Retrieved 13 May 2011. 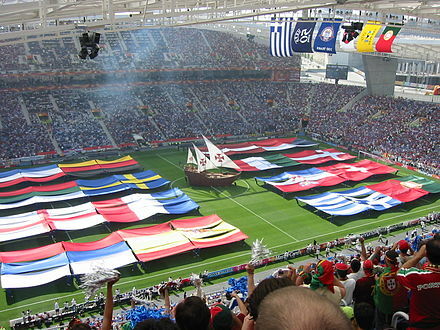 Wikimedia Commons has media related to UEFA European Championship . 1 Considered a successor team by FIFA, or have competed under another name(s).